Greetings faithful readers! Guess, what?! I got a library card to the wondrous Moreland library system. After doing such, and meeting the very nice lady who spent a few years in Maine, I decided to walk.... no strut... naw, I pimp'd-out with some Stephen Hawking action. That's right fellow physics nerds, I picked-up/checked-out/ and read Hawking and Molidnow's The Grand Design. And I must say, that book is fantabulous! Marvelous ideas on the birth of the universe. But what really bakes my brain is the mention that time is just a variant of space. Wha, wha, wha?! you say?! Sure, Einstein and his General Theory of Relativity introduced space-time, but for some reason, I never thought of time as being a weird space-like thing. But, the aforementioned book by H&M (I guess I can call 'em that) mentioned that time is just space but only in one direction. Hmmmmm, crikey! I think they are right! Sweet sassy molassy, that's mega-badassery. Anyways, hope you all enjoy that nugget of knowledge. That's it for now. Much love and eat babies. 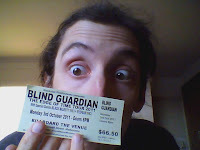 I saw Blind Guardian (from Germany) last night with two Australian acts, Eyefear and Black Majesty at Billboard. The show was amazing. I also caught up with some friends. Much fun. MORRRRRRRRDORRRRRRRRRRRRRRR MORDDDDDDDDOOOOOOOOORRRRRRRRRRR! Ohhh yea, pics or it didn't happen right? (This doesn't do it justice but still). Also, the process of ticket acrual is unusual. For those who have print-out tickets, myself included in that subset, we give away our entire ticket upon entry into the venue. After the show, tickets (as seen here) are provided for free! That way, if you are plastered out of your mind, you still can remember where you went.